During a 2010 visit to Mexico City, I was a bit rushed to squeeze in my favorite places to eat since I was only in town for a few days before and after our family trip to Aguascalientes for Abuelita Ana’s birthday. After visiting the Frida Kahlo museum with my suegra in the late morning and a quick stop at the mercado in Coyoacán to pick up a few goodies to take home, we headed to El Bajío in Polanco for lunch. Since we were in no hurry, we settled into a cozy little table for two in the back near the beverage bar where they make the coffee and juices. We both decided to have agua de piña to drink, so when it came time to order we asked for a large pitcher to share. Aside from agua de piña, El Bajío has all kinds of other fruit flavors including, but not limited to: naranja (orange), toronja (grapefruit), nopal (cactus paddle), zanahoria (carrot), papaya, jitomate (tomato), melón (cantaloupe), mango, lima and mandarina (mandarin orange) depending on what’s in season. Basically, any fruit can become an agua fresca—even tunas, the little green or red varieties of cactus fruit. But my all-time favorite agua fresca is horchata, a milky, cinnamon-infused, rice-based drink. Agua de piña also happens to be one of José’s favorite aguas frescas, so I make it at home on a somewhat regular basis. 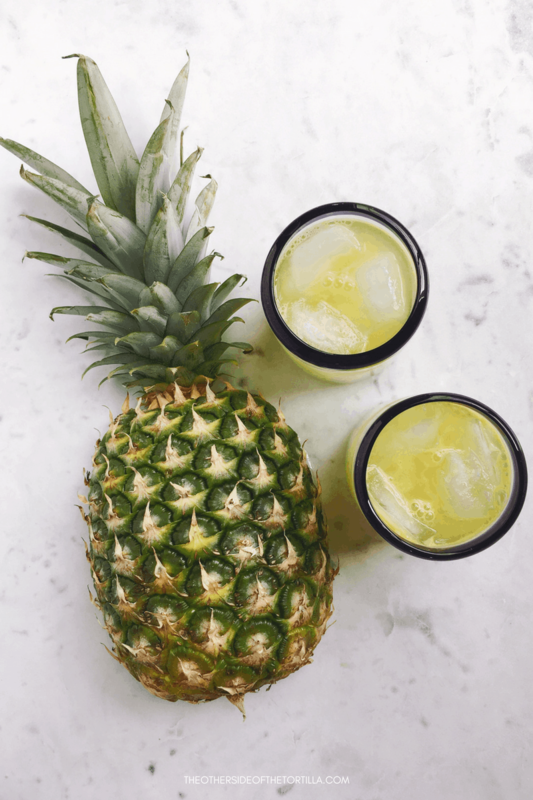 If pineapple isn’t exactly in season or you happen to choose an unripe pineapple, it might be weak in flavor, and you can’t always tell how sweet the concentrated juice is going to be until you’ve mixed it with a bit of water. For that reason, I usually wait to see if I need to add simple syrup until I’ve mixed in 2-3 cups of water. With the method below with an electric juicer, I’ve never had to add simple syrup at all. A word of advice: much like how agua de jamaica is a diuretic, agua de piña can have semi-laxative qualities if you consume too much, so remember to drink it in moderation. 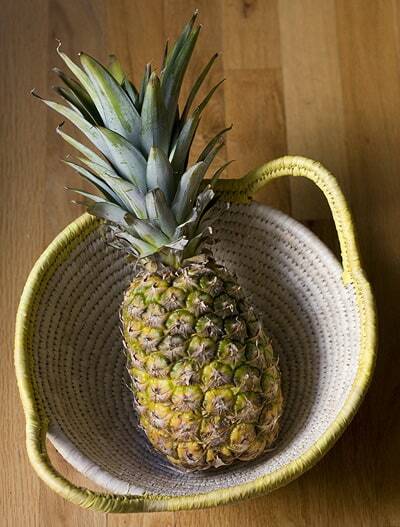 To choose a ripe pineapple at the grocery store, try to gently pluck the leaves from the center at the top. If they come out easily, the pineapple is ripe. If they practically fall out just from touching them, the pineapple is likely overripe. If they take a bit of tugging, the pineapple isn’t quite ripe yet. Make sure there’s no mold on the bottom of the pineapple, at the stem. The color of the pineapple’s skin on the outside is not necessarily an accurate indicator of ripeness; some kinds of pineapple have golden yellow skin when ripe, but others can have green skin. The leaves are a better bet to know whether it’s ripe or not. To use the core or not to use the core? 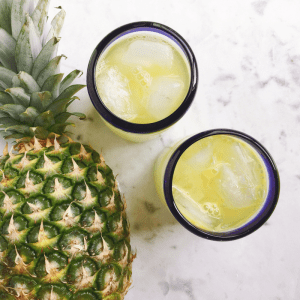 Yes, you can absolutely use the core of the pineapple to make your agua fresca. Although it’s tougher and more fibrous, it has lots of nutrients that make it good to consume, and since you’ll be juicing it anyway, you won’t have to deal with chewing the tough part. Plus, it’s less waste. You don’t need a fancy juicer; I have a Jack LaLanne stainless steel juicer I bought on Amazon a few years ago. Since I got my juicer, I’ve stopped using the blender method to make this recipe because the juicer is easier to clean up, takes less time overall, and you get a much more concentrated juice from the pineapple. 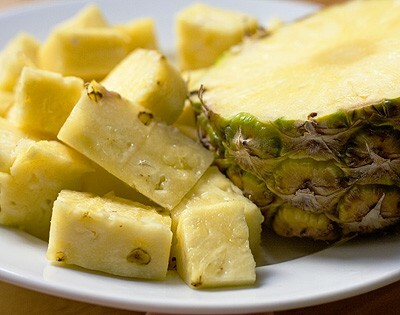 Remove top and bottom of pineapple and cut the skin off all the way around the fruit. Chop into spears, keeping the pineapple core intact. Put all the pineapple, including the core, through your electric juicer. It should yield about 3 cups of concentrated juice. It's normal for the juice to have a foamy top straight out of the juicer. Strain the concentrated juice through a fine mesh sieve into a pitcher to remove the foamy top, then add 3 cups cold water and stir well to incorporate. Taste to see if you want to dilute more; if so, add water in increments of 1/4 or 1/2 cup at a time until the juice is to your liking. You should not need to add any sugar or simple syrup. Serve over ice. Store in the refrigerator for up to 4 days. Cut the top and bottom of the pineapple off and then remove all the outer skin. You don’t have to worry about being too precise; the remaining tough skin will be ground up in the blender and won’t make it through the cheesecloth anyhow. You don’t need to worry about discarding the core for the same reason, so just chop it all up and throw it in. Put the pineapple in the blender with up to a quarter cup of water to assist the blender in breaking it down. Puree until completely smooth. Using a large bowl spread the doubled cheesecloth over the bowl and pour a bit of the puree into the center of the cloth. Close tightly and begin to twist and gently squeeze the cloth so the juice streams through the bottom of the cloth and into the bowl. You’ll need to repeat this several times until all the puree has been strained. After each time the puree has been juiced, remove the remaining pulp from inside the cloth and discard it. The concentrated juice will be slightly frothy on top, which is completely normal. The pineapple puree should yield between 2 ½ and 3 cups of juice. Depending on how sweet your pineapple is, you may or may not want to add sugar to the water. If you do, the best way is to make a simple syrup with ½ cup granulated cane sugar to 1 cup of water. To make the simple syrup, just heat the water and sugar until the sugar is completely dissolved. Remove from heat, let cool and then mix in with the juice. You may want to only sweeten the water a little by using the syrup and mixing the rest with unsweetened water. It’s really a matter of taste preference. Combine the pineapple juice, water and any simple syrup (if you wish to sweeten it). Stir well and refrigerate until well-chilled, about an hour. Serve cold or over ice. Keeps in the refrigerator for up to 4 days. This post was originally published August 28, 2010, but has been updated in 2017 with the additional method using an electric juicer. Pretty fotos as usual. I like your interpretation of mid-day rain storms. It was that way when I went to El Salvador and I loved it. It was such a good hard rain, and we’d just lay in the hammock on the enclosed porch and talk. Thanks for the tip on picking a ripe pineapple! I didn’t know that one. Hands down Horchata…Jamaica is a close second! I think I’m going to give your agua de piña a try along side Pati’s Tepache before summer’s end. Oh, by the way, this recipe made me realize that the licuadora and strainer are the two most important gadgets in the modern Mexican kitchen. When do we not use the blender, right? @Tracy You’re welcome – you know, I’m surprised a lot of people don’t know that’s the proper way to tell if a pineapple is ripe. Even my mom didn’t know! My husband taught me that one. Fragrance does not always indicate that it’s ripe. @Gabriela I make jamaica most often because it’s the least amount of work 😉 I love horchata and prefer to make my own because there’s really nowhere I’ve found in Chicago that tastes better than homemade. Let me know how your agua de piña turns out. The last batch I made didn’t turn out very sweet and my husband doesn’t like when I add the simple syrup to the pineapple juice. I think the best way to ensure that it’s sweet enough to not have to add the sugar is by waiting until the pineapple is slightly overripe when the flesh is super yellow and fragrant. And yes, I completely agree that the licuadora and strainer are key tools to have! I most often use the cloth strainer method than a mesh sieve because the cloth does a much finer job with liquids for beverages where you don’t want any roughage slipping through. I don’t have a metate at home (someday when I can carry one back from Mexico, haha) but I have my own molcajete. I tend to use my blender more for things like sopas, frutas and simple salsas, but the mocajete for more complex salsas that need the ingredients to be layered. I love how you link the recipes to the stories Maura! Plus the pictures are so beautiful, the first one with the piña on the basket is my favorite! Que fresca se ve!! Now, let me tell you that I’m not a fan of Aguas frescas EXCEPT Horchata and Jamaica! I lived for 3 years in el DF and did drink lots aguas but I don’t miss them, LOL! In Venezuela we are used to drinking what we call batidos, they are thick juices mixed in the blender, just fruit water and sugar, but most of them are thick, so for me the aguas were so aguados!! But since Horchata and jamaica were new flavors I think that’s why I liked them most. 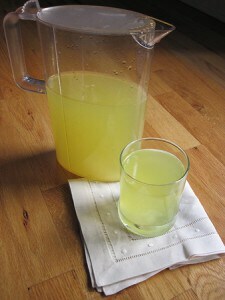 Muy lindo tu blog, I really have to try this agua fresca. Yum, yum, yum! I used to enjoy this as a treat when I was young. It was one of my favorite drinks. Thank you for reminding me about it and the recipe so that I can recreate it for my own children! I’m not sure I’ve ever tried an agua fresca before, at least I’ve never heard that term specifically. It sounds like juice? Or diluted juice at least? Like Dariela, I know of batidos and thicker juices…though this sounds very refreshing! @Dariela Amiga, I didn’t know you lived in DF for three years! Now we have even more to talk about when I see you in Miami next month! I also love batidos but prefer aguas frescas because they’re so refreshing and not heavy like some batidos can be. @Rory & Liz – Thanks for stopping by! Glad you liked the recipe! @Monica Glad to remind you of it. Let me know how the kids like it. @Melanie It sometimes amazes me how different our experiences can be despite Puerto Rico being so close by. It’s one of the cool things about being Latino that we all have different cuisines but with common elements.